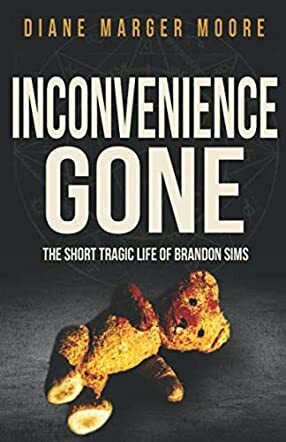 Inconvenience Gone by Diane Marger Moore is the true story of the investigation into the disappearance of Brandon Sims. Just 4 years old, the last time anyone saw Brandon was 3 July, 1992 at a birthday party. His mother, Michele Jones, told different stories to different people. He’d gone to live with his father. He’d gone to live with his grandmother. When his father came to see him, Michelle’s stories started falling apart and, eventually, she told a police detective that she had killed her son accidentally. But she wouldn’t tell anyone where his body was. Detective Crooke doesn’t believe her and goes to Diane Marger Moore, novice prosecutor, to take the case. There is no body so can Michelle be convicted of murder? As witnesses begin crawling out of the woodwork, the story takes some strange turns as Crooke and Moore fight for justice for little Brandon Sims. Inconvenience Gone by Diane Marger Moore is a riveting true story. It does read very much like a crime novel but you know that you are reading a heartbreaking story of truth. There is plenty of detail and I learned an awful lot about how a criminal investigation proceeds, how the courts work, and the limitations and obstacles that both detectives and prosecutors have to overcome to get anywhere with a case. Diane has written a gripping book, portraying every scene in harrowing detail. She tells her story succinctly and to the point and, right to the very end, you can’t put the book down. Every twist leads down another alley and every chapter ends leaving you needing to know more. This is an excellent true crime tale, one of the best I have ever read, and I think anyone who has an interest in crime, punishment, and justice will love this.